Looks like the OC DA’s office is on a roll. 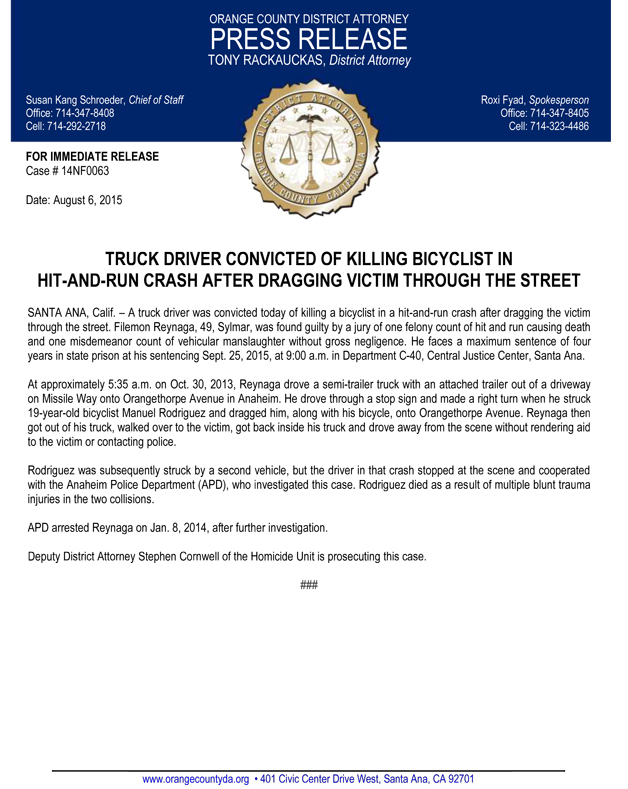 In their latest court victory, truck driver Filemon Reynaga was found guilty Thursday in the hit-and-run death of 19-year old Manuel Morales Rodriguez as he rode his bike to work in October, 2013. Reynaga reportedly drove off after getting out of his truck to look at Rodriguez, leaving him lying unprotected in the street where he was hit by a second vehicle. It was impossible to tell which one ultimately struck the fatal blow. Clearly, the jury decided it didn’t matter, convicting Reynaga of felony hit and run causing death and misdemeanor vehicular manslaughter with gross negligence. It only took them 90 minutes to reach a verdict. He now faces up to four well-deserved years in prison. Thanks to Edward Rubinstein for the heads-up. A man was found beaten to death next to a bicycle in an unincorporated part of the San Gabriel Valley near West Covina early Thursday morning. According to KNBC-4, he was identified by his mother as 25-year old Ontario resident Victor Pacheco after she rushed to the scene. Witnesses saw him being chased on his bike by a blue pickup just hours before his body was found in a vacant lot. Before you go to CicLAvia this Sunday, take a moment to brush up on these safety tips. Most important, in my experience, is to remember it’s not a race and maintain a safe speed; it’s the differential between fast and slow riders that seems to cause most conflicts. And always look behind you before you change directions, even to just pass another rider. Get discounts along the route. Oddly, Tito’s Tacos doesn’t seem to be on that list. 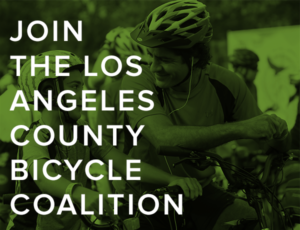 As if CicLAvia itself wasn’t reward enough, you can enter to win free prizes including a weekend in Culver City, a Tern foldie and Cirque du Soleil tickets. 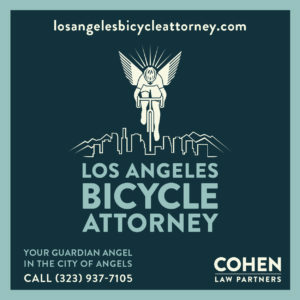 Or win CicLAvia swag by taking photos at their photo hunt stops. As a personal aside, you’ll find some of the city’s best coffee at The Conservatory along the CicLAvia route on Washington Blvd in Culver City; tell ‘em I sent you. Not that they know who the hell I am. Update: Margaret reminds us that the Conservatory is closed on Sundays; hopefully, they’ll make an exception just this once. 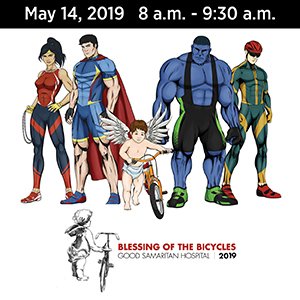 And just in time for CicLAvia, Walk Bike Burbank is offering free bike tune-ups on Saturday. VeloNews provides a nice tongue-in-cheek examination of what it would look like if the NFL was run as badly as pro cycling. And 37-year old Ivan Basso will determine his future in the coming months after recovering from surgery for testicular cancer. A Westside resident says there aren’t enough bicyclists on Westwood Blvd to justify bike lanes, and bus-only lanes could move more people through the corridor. Never mind that bike riders are allowed to use bus-only lanes, and there might be more bike riders on the boulevard if they had a safe place to ride. West Hollywood now has a bike-through coffee and juice window. Registration is now open for Santa Monica’s Breeze bikeshare system; a trial system will kick off for six weeks next Thursday, while the full system is expected to go into operation in November. An Irvine company is modifying their single-lever brake system to work on children’s bikes; one lever applies the front and rear brakes simultaneously, eliminating the risk of a major endo. Not even a decorative bike attached to a private Bakersfield community library is safe from the scourge of bike theft. A San Francisco bicyclist puts his foot down at every stop sign, since the SFPD is now ticketing bike riders — without legal justification — if they don’t, and nearly got run over as a result. Meanwhile, the SF Gate calls the crackdown on scofflaw cyclists a waste of police resources that endangers San Franciscans and incentivizes bad behavior. When a Tahoe tourist on a rental bike does something stupid, it does not reflect on every other cyclist. When I observe stupid driver tricks, I don’t think it makes every other driver look bad; they usually do that themselves. Bike lawyer Bob Mionske examines three-foot passing laws, and the need for police to get with the program, already. Bicycling looks at the 500-plus pound man who started bicycling cross-country to lose weight and get his wife back; the couple has reunited and she’s now riding along with him. The Department of DIY strikes again, as a Portland bike rider paints a warning on a hazardous road grate after getting tired of complaining about it for the past eight years; needless to say, the state DOT is not pleased. A road-raging Kansas cyclist is lucky to get off with just 59 months in prison for shooting a motorist during a dispute; the victim gets just $2,600 of the court-ordered $19,600 restitution, despite losing an eye. After a high school student in my hometown has his bike stolen, police find it 775 miles away in Abilene TX. And he gets personal return service, as a detective just happened to be driving down with his daughter to visit a Texas university. Nice story, as people pitch in to help a homeless man biking across the US who cares for every stray dog he finds; the former California resident towed 11 dogs 2,000 miles in his homemade bike trailer. People are fuming in the Bronx over New Jersey getting New York’s latest bikeshare expansion before they do. 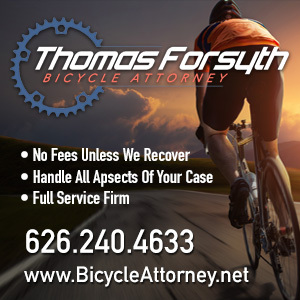 A Virginia cyclist wins a $300,000 settlement after she’s injured when a jogger turned in front of her with no warning. A writer for Miami’s alt weekly gets tired of the constant wrangling over the rights of cyclists, and spells out what riders can and can’t do under Florida law. Writing about Calgary, a columnist says the city’s car culture comes at a steep price. Substituting Los Angeles for Calgary wouldn’t change the story, or the conclusion, one bit. A Toronto writer says it’s a mixed up world when pedestrians try to punch out bike riders, and suggests the solution is to ban cars from certain streets. A London group fixes up old bikes to provide transportation to refugees, and teaches women to ride since many weren’t allowed to learn in their old country. The number of London bike commuters has doubled in the past 10 years. City Lab looks at how Cambridge became the UK’s model cycling city. An Aussie cyclist says we need to future-proof our infrastructure to find a balance between cars, bicycles, pedestrians and public transport. Variety reviews the Hong Kong cycling flick To the Fore, calling it blandly inspiring, but with propulsive, bone-crunching cycling action. Works for me. Nine signs you need to ride more. It’s hard enough riding the Pyrenees, Alps and Dolomites back to back; now imagine doing it with one leg. And evidently, drunk bicycling is a bigger problem than we realize; a new bike lock with a built-in breathalyzer will keep you from unlocking your ride if you’re wasted. Now if they could only make something like that to keep drunk drivers off the road. Thanks to Mike Wilkinson for the link. We lift up our prayers for the family and friends of Mr. Pacheco, and that his murderers would be brought to justice. Coffee Conservatory is great…even has a bike corral. However, they are closed on Sundays. Curious to see if they’ll open for CicLAvia. This is going to be the best one! Can’t wait. Shining up my bike. See you at the Waffle Truck!